The Young and the Restless (Y&R) spoilers for the week of February 11 tease that the Newman family will be rocked by Nikki’s (Melody Thomas Scott) murder confession. Victor (Eric Braeden) tries to do damage control but he’s unsuccessful. In the end, Nikki is arrested and the Newmans’ are left scrambling to get her out of jail. Rey (Jordi Vilasuso) and Christine (Lauralee Bell) decide it’s time to formally charge Victor for JT Hellstrom’s (Thad Luckinbill) murder. Victor believes the recording the police discovered is edited and he planned to prove it. As the police put handcuffs on him, Nikki started to freak out. She appeared to have something to pay, but she wouldn’t just come out and say it. Michael (Christian LeBlanc) and Nick (Joshua Morrow) encourage Nikki to let the police arrest Victor and they will get him home as soon as possible. However, Nikki refuses to let Victor go down for a crime she committed. Nikki blocks the door so Christine and Rey couldn’t take Victor to jail and book him. She blurts out that she was the one who killed JT. At first, Christine didn’t believe her. She thought it was just a way to delay everything. Then, she saw how tortured Nikki looked and she began to think that she may be telling the truth. Rey removes Victor’s handcuffs and they put Nikki under arrest. Victor and Nick worry about Nikki being in custody. They are not only worried about her hearth, but they worry about her state of mind. She could tell the police everything she knows including revealing that Phyllis (Gina Tognoni), Victoria (Amelia Heinle), and Sharon (Sharon Case) were all involved in the JT coverup. What do you think will happen to Nikki now that she’s confessed to murder? 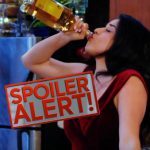 Don’t forget o come back later for more The Young and the Restless (Y&R) spoilers, news, and casting updates!